On the 17th March, 1805, the States-Council of the Italian — previously Cis-Alpine — Republics, changed the form of government into a Monarchy, electing Napoleon as the first hereditary King of Italy. He was crowned as such at Milan, on the 20th May of the same year. The crown used, on that occasion, was that of the ancient Longobardian Kings, which had been preserved in the Treasury of the church at Monza, near Milan. It consists of a golden hoop about four fingers wide, finely chased, and adorned with precious stones in the form of an antique diadem, behind which is attached an iron ring of about one finger wide, which, according to tradition, had been forged from the nail of Christ's Cross, and from which the title is derived. Napoleon founded, in commemoration of his coronation, and at the same time as a reward for those who were to distinguish themselves in his new kingdom, on the 5th June, 1805, an Order, for the decoration of which he adopted the figure of the "Iron Crown", and called it "Ordine della Corona di Ferro" (Order of the Iron Crown). The reigning Kings of Italy were — by the statutes — to be Grand Masters of the Order. The number of the Knights was originally limited to six hundred and twenty, divided into three classes : Dignitaries (twenty). Commanders (one hundred), and Knights (five hundred), all of whom were to be in the enjoyment of pensions. By an Imperial decree of the 19th December, 1807, the number was increased — owing to the increased extent of the kingdom — to thirty-five Dignitaries, one hundred and fifty Commanders, and eight hundred Knights, exclusive of foreigners and members of the Imperial family. Frenchmen, generally, were not to be considered as foreigners. The pension of the first class was fixed at 3000, of the second at 700, and of the third at 300 lire. 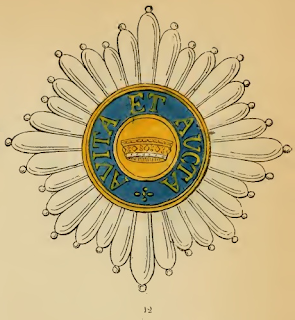 The badge was the Iron Crown, the middle of which contained the French Eagle with raised wings. Round the ring of the Crown was the legend : "Dio me la diede, guai a chi la tocca" (God has given it to me, woe to him who dares to touch it !) while the front exhibited the effigy of Napoleon. 1. The function of Grand Master should be inseparably vested in the Imperial Crown of Austria, and the nomination of members solely dependent on the will of the Emperor. 2. No one should be allowed to claim or petition for the Order. 3. The Knights to be divided into three classes, without any further distinction beyond that of the number, which was limited for the first class to twenty, the second to thirty, and the third to fifty, exclusive of the princes of the Imperial House. 4. All individuals of merit and distinction to be eligible for the Order. The decoration of the previous Order was abolished, and that of the new one (No. 13) now consists of a golden crown (of the same form as the Iron Crown), upon which is placed the Austrian eagle on both sides, bearing on the obverse a blue scutcheon upon the breast, with the letter F (Francis) in it, and on the reverse the year 1816 (the year of its foundation). 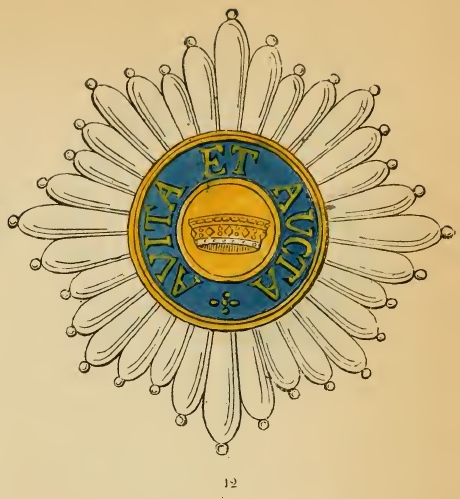 The Knights, of the first class, wear the decoration across the right shoulder suspended by a broad gold-yellow ribbon with dark blue borders, in addition to a star, embroidered in silver, on the left side of the breast, the centre of which contains the Iron Crown, and round the blue edge are inscribed the words : "Avita et Aucta" (Ancient and extended). (No. 12). On solemn occasions the decoration is worn by a gold chain round the neck, the links of which consist alternately of the letters in monogram "F. P.", the Iron Crown, and a wreath of oak kaves. (No. 16). velvet with silver embroidery, and rests in a sword pocket. The ceremonies of the nomination are the same as with all other Austrian Orders. The annual festival is held on the first Sunday after the 7th April — the day when the Lombardo-Venetian kingdom was established.